Could you please review this pull request, which removes the sizes attribute for <amp-iframe> and <amp-video>? Before, there was a workaround to ensure these didn't overflow. I had added style="max-width:100%"
We don't need to remove sizes from <amp-img>, right? The discussion in PR #921 only briefly mentioned <amp-img>, though the referenced amphtml issue # 11575 discusses <amp-img>. Sorry, Weston, I might have missed the real need of removing sizes. It sounds like the main need was removing them from images. If there's still a need to remove them from images, I'd be happy to do that. Issue #864: Remove 'sizes' attribute for <amp-iframe> and <amp-video>. Before, there was a workaround to ensure these didn't overflow. Also, this updates the PHPUnit tests. Issue #864: Remove extra line in set_layout(). I had copied this line into the block above. But it's not needed there. These 3 lines are copied from enforce_sizes_attribute(). Would you get some QA support for check if the changes help or hinder? Would this potentially solve #919 as well? Commented on the other one – for the reasons outlined, I'd definitely recommend removing. @pbakaus Thank you for clarifying. @kienstra Please remove sizes for images as well. Issue #864: Remove the 'sizes' attribute from <amp-img>. On Paul Baukus and Weston Ruter's suggestion. Thanks for your guidance on the sizes attribute. The commit above removes them from <amp-img> elements. @westonruter, I still need to set up tests for the <amp-iframe>, using the test environment that you created. Issue #864: Remove layout="responsive" from <amp-iframe>. This could lead to unexpected results. This will increase it to fill the container. But it could create an issue in other places. 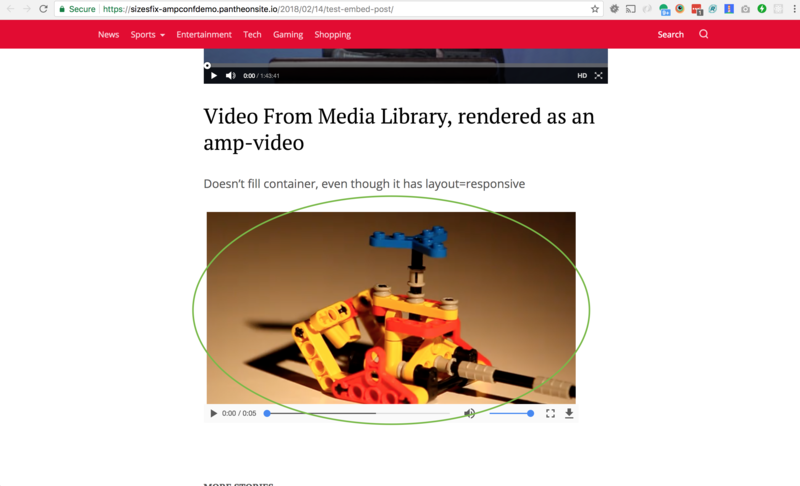 The <amp-video> looks to display well with no sizes, and with layout="responsive". This ensures that it doesn't overflow its container, like a sidebar. But the <amp-iframe> does expand to fill its container when it has layout="responsive". This might cause surprises with the new version. So I removed my addition of layout="responsive" to the <amp-iframe>, and instead re-added style="max-width:100%". This is just a workaround, and it might help to eventually have .amp-wp-enforced-sizes in the <style amp-custom>. Weston added this, and it describes where it will appear. Question: Should this eliminate the need for https://github.com/xwp/ampconf/blob/992fa40c75b9be898326b186a4c3efd0dc788325/inc/template-functions.php#L72-L112 ? Issue #864: Remove <amp-img> sizes attribute if present. An earlier commit only prevented adding it. This removes the attribute it it's present. Thanks for deploying the changes. This new commit removes the sizes attribute, where this previous commit only prevented it from being added if it wasn't present. As you probably know, the filters you mentioned override the removal of the sizes. When they're present, this plugin's removal of the sizes doesn't apply. Still, I need to look at the underlying cause causes of those filters, and whether it's appropriate to remove them. The theme PR #81 removes the workaround filters you mentioned. In testing it, I noticed an issue in theme styling, and described it on the ticket. Issue #864: Add layout="responsive" to <amp-iframe>. Iframes from WordPress embeds usually have width and height. In AMP, the inferred value layout for this is fixed. The height won't adjust to the new ratio. the only way to ensure the same aspect ratio. @kienstra We need to add layout attribute here so that it's possible to control the image sizing at the theme's level (see my comment in the AMPConf theme). That sounds good, @delawski. If it's alright, I'll work on this in several hours. We'll need to allow data-amp-layout attribute to Kses for it to be saved with unfiltered_html. Thanks, @westonruter. The 2 commits below convert 'data-amp-layout' to 'layout' in the image sanitizer, and allow 'data-amp-layout' in wp_kses(), when in a 'post' context. As the preprocessor won't modify them. Add this attribute to the allowed list for <img>. Is it alright to only filter the allowed attributes in a 'post' context? I'd say it should be allowed in any context where an img is allowed with a width and height. Thanks, this commit allows data-amp-layout whenever an <img> permits width and height. This shouldn't be added to AMP_WP_Utils since it is marked for deletion in #876. Let's just put it in AMP_Theme_Support for now. It's the only class that is using it, and we'll probably break up that class into separate classes later anyway. Thanks, I'll move it to AMP_Theme_Support. This commit moves add_layout() to AMP_Theme_Support. Next, I'll merge in develop and resolve the conflicts. Update unit tests for layout. 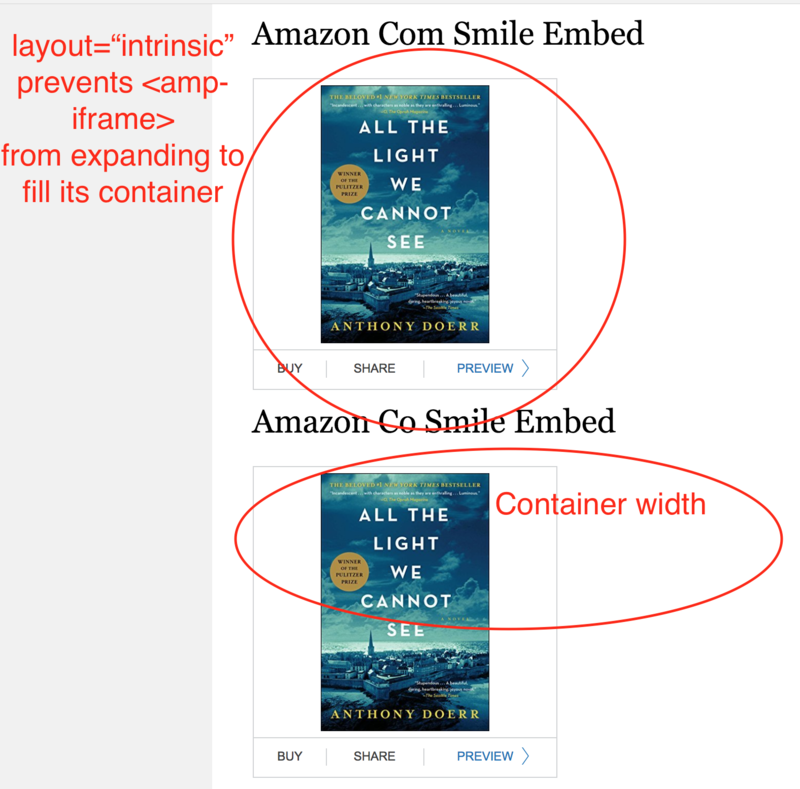 Add layout="intrinsic" to some <amp-img> tags. for other tags as a default value. Align equals signs, use () after class. In response to Travis errors. Use parentheses in class instantiation. Set default layout of <amp-iframe> and <amp-video> to intrinsic. Before, this set the layout of those elements to responsive if the height and width weren't empty. shows that this displays as expected. Thanks a lot for your commit to fix the image size issue. If it's alright, I cherry-picked it into this pull request. I had to change the target branch of this PR to 0.7 for the upcoming release. You already did us a big favor by working on this so quickly, so no pressure if you can't get to this. But does the commit I made above look reasonable? It does something similar to what you did, but for <amp-video> and <amp-iframe>. This could prevent the <amp-iframe> from expanding to fill its container. Before this PR, most embed iframes had a height and width, so I think AMP inferred a layout of fixed. And they wouldn't expand to fill their container. amp-video with intrinsic works really well and it's even recommended in the docs, so no comments there. As for iframes, there isn't a one-size-fits-all solution. Some iFrames can be responsive (hence intrinsic works for these types of iframes allowing them to grow and occupy the available space), and some can be fixed, it all depends on what rules are inside of that iFrame, data we can't know from outside. And knowing that, intrinsic makes more sense than responsive for amp-iframe as well, but there can be scenarios where a fixed layout would make more sense. That's why we need the iframes to receive a fixed-height layout when no width is present. Think the FB like button (it used to be an iframe eons ago) -> that was not responsive, as the button didn't grow to 400px width if you would have placed it in such a large container. As long as it's catered for iframes with height-only dimension provided, I'm good with the default being intrinsic. Remove my duplicate layout assignment in AMP_Video_Sanitizer. And the removed logic sometimes reassigned the layout to responsive. So remove this extra logic. Thanks a lot for your comments above about <amp-iframe> and <amp-video>. That's why we need the iframes to receive a fixed-height layout when no width is present. Thanks, that helps a lot to clarify this. This line on this PR ensures that amp-iframes with no width have layout="fixed-height". Conditionally set layout to 'responsive' for <amp-video>. It's a holiday weekend, so there's no hurry to review this. But when you have a chance, you please give this a final review? @mehigh's comments and commit helped a lot to clarify this PR. Also, this existing assertion ensures that amp-iframes with no width have layout="fixed-height". The snipped that I posted which turned out to not work was luckily never part of the diff. It turns out that my idea of using layout=“intrinsic” for <amp-video> also doesn’t work, as the specification doesn’t allow this. I reverted it. This layout works very well for most AMP elements, including amp-img, amp-video, etc. Of course, we'll also validate all of this in the 3 testing environments for 0.7. The mixed messages around intrinsic being viable or not for amp-video is odd. Merge in 0.7 branch, resolve conflict. Both branches added a test in the same place. Let's get this in testing!